LG has rolled out a firmware update for its LG G Watch following concerns that the gold terminal pins on the back of the device were causing skin irritation and even burns for some wearers. The problem, as reported by Android Police, is a constant electrical current sent through to the exposed POGO pins while the device is being worn. The update from LG, which is yet to be officially acknowledged by the company, has been sent to stop that current while the device is in use. 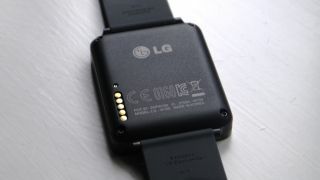 An LG customer support representative did told one G Watch owner: "Recently it has come to our attention that a small number of G Watch devices have been reported to have developed discoloration and residue buildup on the terminal pins located on the back. Have you noticed discolouration of the pins on your G Watch? Any skin irritation? Let us know if this stops now the update has rolled out.